Former Colorado Governor John Hickenlooper found himself in hot water following remarks he made about women running on presidential tickets during a CNN town hall. "Governor, some of your male competitors have vowed to put a woman on the ticket," began CNN’s Dana Bash. "Yes or no, would you do the same?" CNN political reporter Dan Merica asked Hickenlooper about the response later. "I caught up with Hickenlooper after his #CNNTownHall," Merica tweeted. "He stood by this comment, saying his point was ‘too often media discounts the chance of a woman winning.' ‘That is what I am talking about. People can take it out of context,' he said." I caught up with Hickenlooper after his #CNNTownHall. He stood by this comment, saying his point was "too often media discounts the chance of a woman winning." Hickenlooper's hometown paper did an entire story following up to the CNN remarks on how the former two-term mayor and governor has a history of verbal miscues. "America, meet former Colorado Gov. John Hickenlooper, known throughout the Centennial State for putting his foot in his mouth," the Denver Post began. 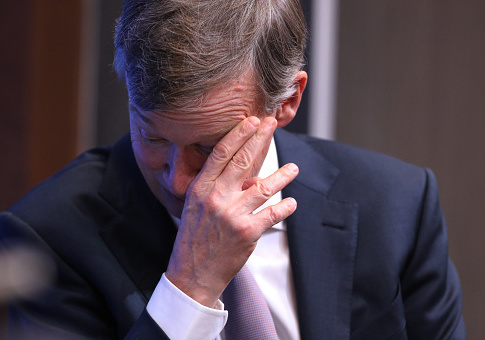 "Hickenlooper—in classic form—on Wednesday fumbled a question about the diversity of the 2020 presidential field during a televised CNN town hall." The article went on to highlight smaller verbal gaffes he had made which had slight sexual overtones, but generally weren't political or policy related. However, Hickenlooper has a long list of other gaffes and baffling statements that have tracked him through his political career. Just days into his presidential run, Hickenlooper refused to call himself a capitalist during a TV interview, which led to him trying to clarify for the next several days that he was only trying to avoid political "labels." He caused controversy in the Latino community when discussing immigration with the Wall Street Journal in 2014. "What’s amazing to me is, a lot of young Latinos, the vast majority don't care about a pathway to citizenship," the paper quoted him as saying. "They want to be able to get on an airplane and get down to Mexico City and visit their grandparents. And they want to get a job and be able to get paid over the table. Why don't we just take the pathway to citizenship and say, ‘We're not going to worry about it.' Let's have a robust guest worker system where everybody gets five years and we secure the border and we actually hold business accountable if they're going to pay people under the table." He later walked those comments back, telling the Denver Post, "What I said in the interview, which didn’t come out, is I have always believed in a pathway to citizenship." However, in a closed-door talk with a community group in 2016, Hickenlooper repeated the idea that young immigrants were unconcerned with a pathway to citizenship. Also in 2014, the governor tried to mend fences with county sheriffs in his state who had been opposed to controversial new gun control laws he signed the previous year. The meeting had the opposite effect. "Gov. John Hickenlooper ignited a political firestorm with his comments Friday to Colorado’s sheriffs, saying he was unaware they wanted to meet with him in 2013 to discuss their concerns over proposed gun laws until it was too late and he had no idea the measures would be so controversial," the Denver Post noted at the time. "Hickenlooper also told the County Sheriffs of Colorado at their biannual meeting, held in Aspen, that he regretted not having all the facts when he signed the bills into law." During the Wednesday night CNN town hall, Hickenlooper said he would suspend the federal death penalty if elected president. But remarks on that issue as well have tripped him up in the past. While giving a long interview to a CNN crew working on a death penalty documentary in 2014, the governor was pressed about his decision to issue a "temporary reprieve" for a mass murderer on Colorado’s death row. Specifically he was asked what his reaction might be if his opponent in the upcoming election won—an opponent who had pledged to let the execution go forward. "If that [death penalty] becomes a political issue, in that context within a campaign, obviously there’s a period of time between the election and the end of the year where individuals can make decisions, such as a governor can," the governor told the CNN interviewer. "I could give … a full clemency." CNN never aired those comments and the remarks only came to light because of an open records request. This entry was posted in Politics and tagged 2020 Election, John Hickenlooper, Women. Bookmark the permalink.